» Display header and footer text on Word 365/ 2016 / 2019 and Google Docs documents first page only? Display header and footer text on Word 365/ 2016 / 2019 and Google Docs documents first page only? I work as a business analyst and often use Microsoft Word as well as Google Docs to author management reports which i submit to my management chain. The documents i create have a custom header in which i typically put the report name, its author, date it was written and so on. In the subsequent pages, i would like to display / keep only the report name information. I guess my question is whether what i am asking is even possible in Office 365 version 2016 and Google Docs. In summary: can i set my document header and footer and keep it only in the first page only? We’ll start by explaining the process for Microsoft Word (both Windows and MAC OSX); then we’ll provide a similar process for Google Docs documents. At this point you might want to use a Cover page as the first page of your doc. Optionally, also define a Table of Contents. Navigate to your document first page. In the upper Ribbon, hit Insert, select Header and select your Header from the selection of available Built-In headers (available either locally or at Office.com). In case that you already have a predefined header for your first page, hit Edit Header. The Header & Footer Design pane will be opened. Now it’s time to design your header. Hit the Quick Parts button for available document properties available for use in your header, such as: Author, Subject, Title, Company Name, Phone, Publish date etc’. Your selection of file properties are also available by hitting the Document Info button. At this point you might want to include page numbers in your doc. It’s possible to show the numbers in your document first page only. If you would like to now define a custom MS Word footer in the first page, hit Go To Footer and follow the steps below. If you are done, simple hit the Close Header and Footer button. The procedure for making a custom first page footer is similar to the one we just outlined for the header. From the Ribbon, hit Insert and then Footer, and the set your own design. Use the process outlined in the section below. Chances are, that similarly to our reader who asked this question; you might need a different footer/header from page two onward. All you’ll need to do is after setting your custom cover page header/footer and before closing the header design tab, to go ahead and define a different header/footer for the second page. This will be shown in every subsequent page in your Word file. Once done, close the header design tab. Use the Different Odd & Even Pages check box to specify different header and footer setting depending on page numbers being odd or even. Hit Insert and then select Header and page number. Then check the “Different first page header/footer” box. That will do the trick! Limiting the footer to the first page only is essentially similar to the process we just highlighted for the header. The only difference, is that you’ll access the footer by selecting: Insert, then Header and page number and then go ahead and select Footer. Here’s an example of a custom footer for your Google docs document opening page. Getting rid of both header and footer text starting the second page in both Google Docs and Word is pretty common, and actually done in the same way we just shown. 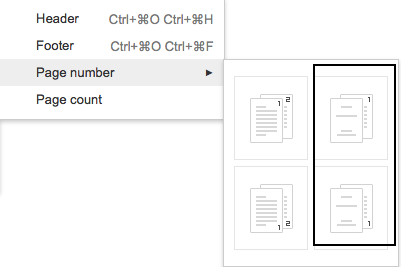 In Google Docs it’s quite easy to show page numbers starting the second page. Got additional questions? Look into our guide on how to get your questions answered. Wow, that’s a lot of work just to achieve that. I did something simpler that worked for my application. 1. Start with a blank document. 2. Click Insert to bring up the Insert Ribbon. 3. Click Header and then click “Edit Header” at the bottom of the open menu. 4. The Header section appears on the blank page. 5. On the Design Tab, click the checkbox “Different First Page”. 6. Edit your header and footer. The subsequent pages shouldn’t have any Header or Footer. I have tried this with the latest version of Word – Office 365 and it still produces the letterhead on every page. I have been trying for weeks to get this to work with no success.